Yesterday, I addressed the political nature of Sandy Weill’s argument and why his conclusions are wrong.ﾠ In addition to his political argument, Weill also tried to make a systemic safety and soundness argument.ﾠ Lost in Weill’s political and public relations justification for a return to Glass-Steagall is the fact that the system is far safer than the one he seems to be concerned about.ﾠ I’m no fan of the Dodd-Frank act – I would have preferred a far less confusing and prescriptive reform of our financial system.ﾠ The law makes it more difficult for U.S. firms to serve customers and compete globally.ﾠ However, there’s no question that Dodd-Frank, however flawed, is contributing to a more safe and sound banking system. Weill cited the need for more capital and less leverage.ﾠ Generally, everyone agrees, and in fact, since the end of the crisis the entire financial sector has increased capital and liquidity levels. As highlighted in the Hamilton Financial Index, the Tier 1 Common Capital Risk-Based Ratio for commercial banks is at an all-time high and has risen 38 percent since the crisis (Exhibit 1). The four largest banks have increased this ratio by the same amount. At the same time, they’ve increased the quality of their capital, as their common equity to assets ratios are at new all-time highs. 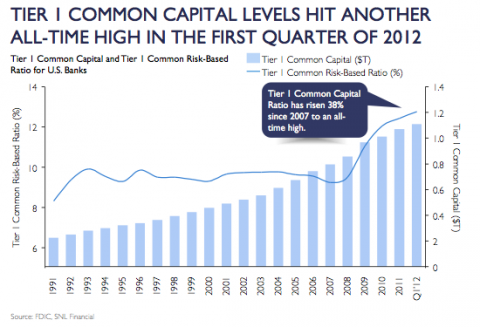 So as more people in Washington clamor for higher capital levels, remember, banks not only have more capital already, but better quality capital than ever before. Similarly, for all the press the Volcker Rule receives, banks have already dismantled and sold virtually all but the barest ability to make markets for clients. Proprietary trading at banks has largely gone away, reducing so-called speculation. Personally, I would prefer to repeal the Volcker Rule – it remains a solution in search of a problem, but the reform is working in ways Sandy Weill would seemingly approve. Finally, Weill’s call for a return to Glass-Steagall was spiced with the common concern that we should never again bail out banks. Weill is either unfamiliar with Dodd-Frank’s actual provisions or has simply chosen to join the collection of eternal disbelievers. If by “bailouts” Weill is referring to the government’s response to the financial crisis in 2008-2009, then he should be pleased. I supported that government response. I continue to support it and would support it again. But that’s not the response you’ll find in Dodd-Frank. Instead, the law’s Resolution Authority only allows the government to wind down – not preserve – failed financial institutions. In the event of failure, it guarantees that bondholders will take losses and shareholders will be wiped out. The past three years have seen significant changes that Weill and others continue to ignore. Rather, they flack an old rule that would not have prevented the financial crisis. The financial crisis actually showed that diversified banks were safer than the simpler commercial and investment banks. And as a result of Dodd-Frank, banks have made real and significant reforms. Going back to an anachronistic law will only hobble both our banks’ abilities to compete in the global market and the ability of our regulators to regulate the global financial sector. Repealing Glass-Steagall helped enable our banks to expand their services and geographies to best serve U.S. clients’ global needs. Now, in the wake of our own financial crisis, a globalizing economy with large banks throughout Europe, Asia and the rest of the world, do we want to hinder the competitive advantage of U.S. firms and reduce the reach of our regulators?